Has a pinkish chest barring over much of the body. Also a distinctive blue ring around the eye. Has a distinctive undulating almost flopping flight. The call is a familiar often heard 'doodle-do' and a rough 'grrr..'. 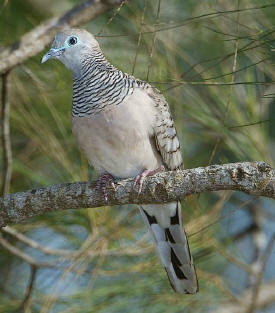 The Peaceful Dove is found from South East Asia, through New Guinea, and to Australia and islands of the Pacific. It is common over much of Australia, except a large portion of the south-west of the continent. Within this distribution it can turn up in almost any habitat, including the edge of the rainforest, tropical woodlands, and urban environments. It normally seems to prefer more open situations and is often not too far from freshwater.